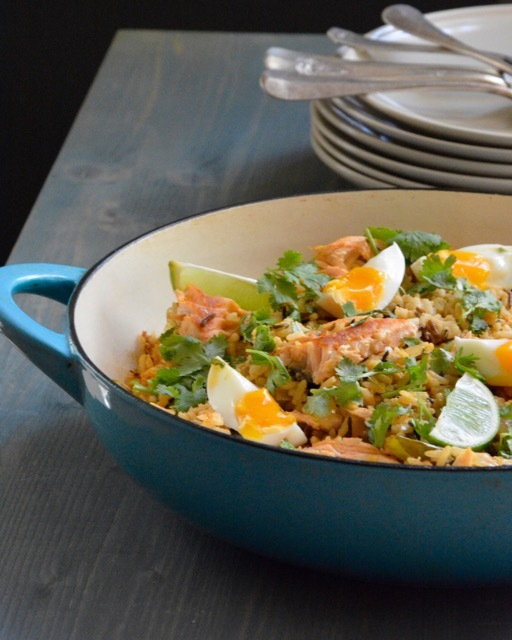 Kedgeree is a traditional British breakfast from colonial India. The original Indian dish consisted of lentils, rice and a combination of wonderful spices. When the British adapted the recipe, they replaced the lentils with fish, usually smoked, and added hard-boiled eggs. In my most recent interpretation of kedgeree I used Panang curry, my favorite of Thai curries, and instead of cream I used creamed coconut, which I find at my local Asain market. Coconut milk works just as well if you can’t find creamed coconut. The tastes in this version is a combination of spicy, tangy, salty and sweet; simultaneously mellow and robust. If you decide to add the eggs you your kedgeree I would recommend that you cook your eggs before you start preparations on the kedgeree. I prefer my eggs medium or even soft-boiled rather than hard-boiled. I like the yolky creaminess of the eggs and how they ooze their golden goo onto the bits of orangy-red rice and coral flesh of the salmon. The salmon is partially pan fried for added color, and the brown bits at the bottom of the pan after frying add additional flavor. But, if I were in a pinch, I would skip the frying and just set the salmon on the top bed of rice to steam as the rice cooks. I suppose steaming the salmon would not only save you time, but it would make the dish a bit healthier. Although, kedgeree is traditionally served for breakfast I see no reason not to enjoy it at any time of day. 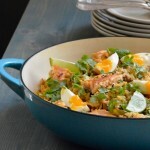 I’ve enjoyed kedgeree for lunch and dinner just as many times as I’ve enjoyed it for breakfast. And I think it would make a surprising and unexpected dish to serve for a brunch. Add 2 tablespoons of olive oil to the bottom of a large sauté pan, over medium-high heat. While the pan is heating, oil both sides of the salmon filet with 1 tablespoon of olive oil and season with salt and pepper. Once the pan is hot enough, add the salmon filet to the pan, flesh side down. Cook the salmon for about 2-3 minutes per side. You want the salmon to brown, but not be fully cooked at this point. Next, remove the salmon onto a plate and set aside. Then, lower the heat to medium and add the onions to the pan. Cook the onions for about 5 minutes, until slightly translucent. If you should find that your pan is too hot and burning the onions, feel free to add a tablespoon of water to the pan. Next, add the Panang curry paste to the onion mixture and stir it into the onions for about 1 minute. It may be necessary at this point to add an additional tablespoon of oil to your pan, if you find it too dry. Next, stir in the rice to the pan. Coat the rice as best you can with the onion mixture, though you may not find it won’t easily coat the rice, nor will it have to. Then, add 2¼ cups water to the pan, and turn the heat to high. Add in the creamed coconut, 2 tablespoons of fish sauce and the kafir leaves. Once the mixture begins to boil, place the salmon filet onto the top of the rice, reduce the heat to low, cover and simmer for the suggested cook time according to the packaging of your rice. Once the rice is cooked and the liquids have absorbed, turn off the heat and remove the pan from the hob. Flake the salmon filet by using two forks. If you’re not a fan of salmon skin, you can remove it before flaking the filet, though I quite enjoy it. “Waste not, want not” is my motto! Squeeze in the juice of half the lime, and slice the other half into wedges for serving, and add 1 tablespoon of fish sauce. Toss everything together and garnish with the cilantro, lime wedges and eggs. Serve immediately. If you are substituting coconut milk for the creamed coconut, reduce the water to 2 cups and cook the rest as directed.